Maggie Dunne ’13, of Scarsdale, N.Y., is a Native American studies major at Colgate. 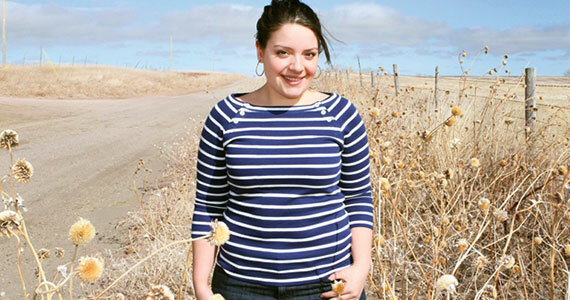 A nonprofit organization created by Maggie Dunne ‘13 has been named one of the top five “literacy champions” of 2012 by Scholastic, a welcome recognition of her efforts to help residents of the Pine Ridge Reservation in South Dakota. Dunne’s nonprofit — recently renamed Lakota Children’s Enrichment (LCE) — was cited for its efforts in bringing thousands of books to reservation schools and for working with school administrators to develop book-incentive programs. She said that Scholastic now will partner with her nonprofit in providing books to the reservation. Earlier this year, Dunne was named winner of the 2012 grand prize in Glamour magazine’s Top 10 College Women Competition. She received $20,000 for the work she has accomplished through her nonprofit. At the awards ceremony, she announced that she would donate the prize to her organization, and leverage its prestige to raise even more money. She did just that, collecting $20,000 apiece from a Colgate alumnus and from Sir Richard Branson, the entrepreneur who was the keynote speaker for the university’s Entrepreneur Weekend. Dunne first met the children of the Pine Ridge Reservation in South Dakota during a volunteer trip during high school in Scarsdale, NY. She started small, with a local coat drive and modest fundraising, and today her organization has distributed more than $100,000 worth of coats, boots, and books to members of the Oglala Lakota Sioux Tribe who live there. At Colgate, Dunne is a Native American studies major. In and out of the classroom she has found many students who want to get involved. Through the Center for Outreach and Volunteer Education (COVE) she held campus fundraisers and started and staffed a summer camp on the reservation. Through the university’s Thought Into Action Institute, she received invaluable advice from dozens of successful alumni who return to campus to teach students to create jobs for themselves through entrepreneurial means. “Friends, family, members of the Colgate administration and faculty, and of course my mentors from Thought Into Action have helped me so much throughout this process,” said Dunne.